From the Le Sais-Tu Department comes a few interesting news bites on this evening’s Euroleague Championship participants. Read on, triviamongers! • Theo Papaloukas is the only player in tonight’s game to have played on Eurobasket- and Euroleague-winning teams, though an FC Barcelona win would also extend this honor to Ricky Rubio and Juan Carlos Navarro, who played with European champion Team Spain last summer. Ten others have accomplished the feat in this decade, a list which includes names like J.R. Holden, Viktor Khryapa and Sarunas Jasikevicius. • Navarro could become the only active player to win a Euroleague title while also holding a spot on the roster of defending FIBA world champions, as Spain took the tournament in 2006. Fourteen retired players have also been simultaneous Euroleague/FIBA world champions, led by the likes of Toni Kukoc, Dejan Bodiroga and Sergei Belov. • Navarro is also the only non-Team USSR, non-Team Yugoslavia player to claim Euroleague, Eurobasket and FIBA World Championship titles. Marko Jaric is the only active player of any nationality to have bagged all three trophies. 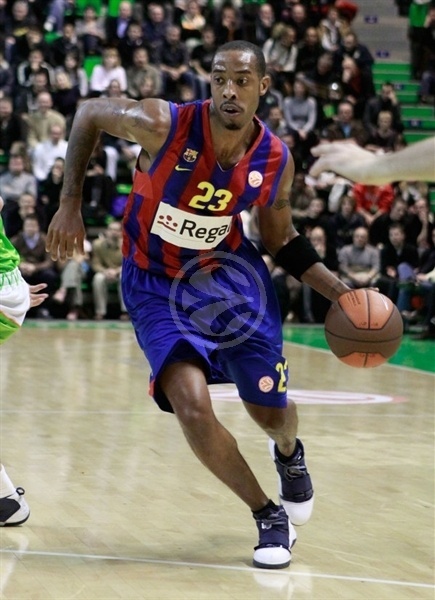 • And one more Navarro stat: The former Memphis Grizzly is the only Barcelona player remaining from the club’s sole Euroleague title in 2003. • Despite his status as the Euroleague’s no. 5 scorer of all-time, Jaka Lakovic is appearing in the first EL championship in his 13-year career (eight with Euroleague teams). • In direct contrast, Terence Morris is appearing in his third consecutive Euroleague championship game – each with a different team. Only three other players have managed to make the finals with three different squads, including Barça’s Erazem Lorbek, but none played in three consecutive championships. • Nikola Vujacic of Olympiacos is in the Euroleague finals for the fifth time in his career, leading all of tonight’s players in the category. • No team has ever won the Euroleague title with the season’s top scorer. This year’s top scorer? Linas Kleiza. • Should Theo Papaloukas take the Final Four MVP award (He contributed 10 points, five assists and three steals against Partizan Belgrade in the semifinal game), he would join an elite group of two who have done so: Kukoc and Bodiroga. • Finally, the Euroleague’s youngest-ever Rising Star Award winner, good old Ricky Rubio, can add one more superlative to his already outstanding résumé: With a Barça win, Rubio would be just the fifth player to have won Euroleague and Eurocup titles. The feat was last accomplished by Robertas Javtokas and Dejan Tomasevic, who were both on Panathinaikos’ championship team of 2007.